Power Up Back to School with Lean Protein! School is back in and so is the ever so popular question, “What’s for dinner?” With a full day of school plus extracurricular activities and sports, it’s important that school-age children have the proper nutrition to fuel healthy growth, development AND playtime. Meals that include lean beef can be a solution to help children fuel their busy bodies, and get the right nutrition from their calories each day. Lean beef provides a simple and delicious way to help children meet the daily recommendations for several key nutrients. A 3-oz serving of lean beef (about the size of an iPhone) contains about 150 calories yet provides more than 10 percent of the Daily Value for 10 essential nutrients. These nutrients, which are essential for healthy growth and development, include protein, iron, zinc, vitamin B6, vitamin B12, niacin, riboflavin, choline, selenium and phosphorus. Plus, beef is a delicious choice that enhances nutritious plates, making it easier to help kids enjoy meals that meet nutrient recommendations. Heat large nonstick skillet over medium heat until hot. Add Ground Beef; cook 8 to 10 minutes, breaking into 1/2-inch crumbles and stirring occasionally. Remove drippings. Stir in water, quinoa, ranch dressing mix and pepper; bring to a boil. Reduce heat; cover and simmer 10 to 15 minutes or until quinoa is tender. Stir in slaw; cook, uncovered, 3 to 5 minutes or until slaw is crisp-tender, stirring occasionally. 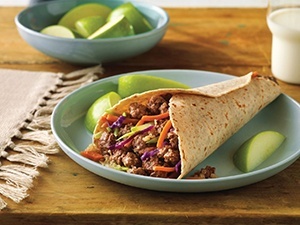 Divide beef mixture evenly among tortillas; garnish with toppings, as desired. Fold over sides of tortillas and rolling up to enclose filling. Nutrition information per serving: 418 Calories; 12g Total Fat; 3g Saturated Fat; 3g Monounsaturated Fat; 76mg Cholesterol; 695mg Sodium; 41g Total carbohydrate; 31g Protein; 5.6mg Iron; 6.4mg Niacin; 0.5mg Vitamin B6; 2.3mcg Vitamin B12; 6.6mg Zinc; 19.6mcg Selenium; 6.8g Fiber.